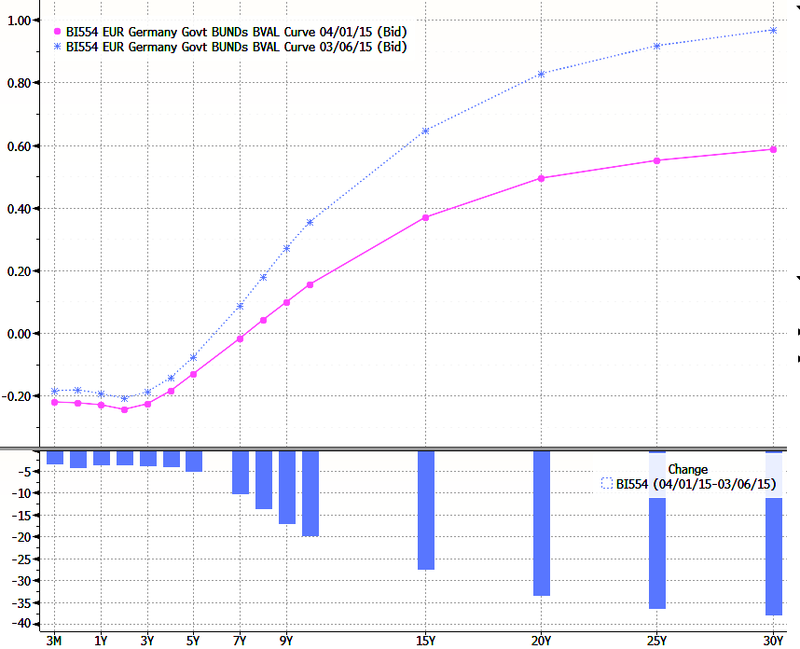 Sober Look: First raw data on ECB QE show asymmetrical purchase patterns; yes, negative rates have a role in it. First raw data on ECB QE show asymmetrical purchase patterns; yes, negative rates have a role in it. 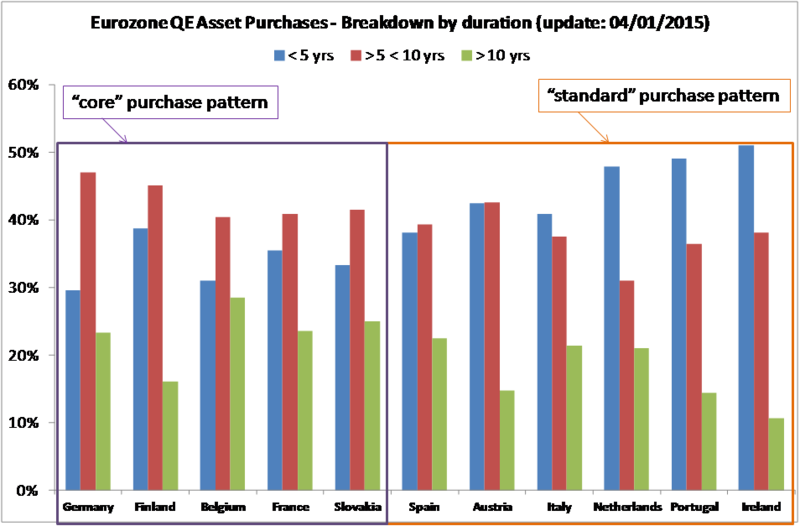 As the first streams of data related to asset purchases are released by the ECB, we can begin to investigate trying to test different speculative theories that have circulated a lot in the past weeks. Many words have been spent about the technical feasibility of the €1.1 tln ECB purchase program given that NCBs have to buy €800 bln of government bonds, potentially disrupting those market segments already affected by unbalances. We are referring mainly to the German Bund market, where negative rates up to the long part of yield curve have become the norm in the past three years: actually we observe negative yield for 7 years bonds (Figure 1). Many concerns are related with the potential eligibility of this growing class of debt securities. In fact the ECB has set a limit of -0.2% (equal to the ECB deposit facility rate), thus implying that government bonds with an implicit yield exceeding this threshold cannot be purchased. But also other core countries are potentially affected: France, Finland, Austria, Netherlands. Draghi has recently reassured the market declaring that he does not foresee a scarcity of eligible securities in the medium term. 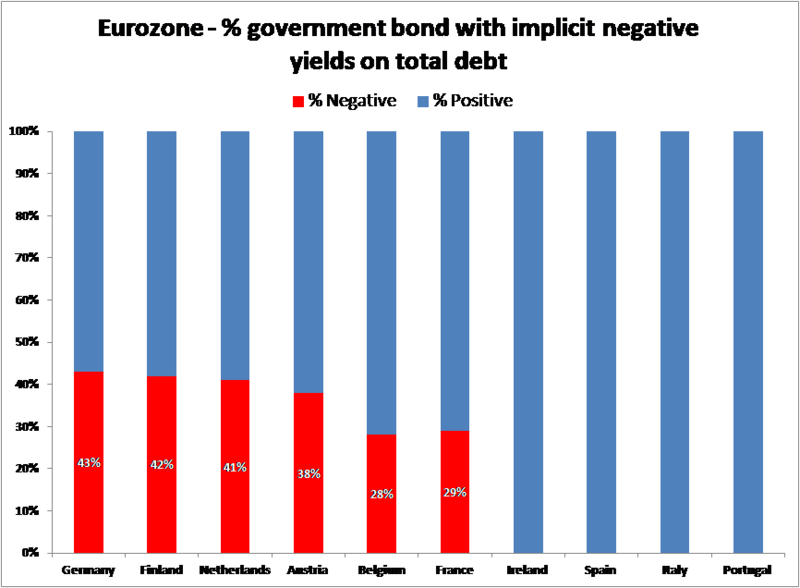 A general overview of yield structure of the German debt says that over 40% of the negotiable bonds is trading at negative implicit yields; on the same boat we see the little open economies of core Europe and, to a lesser extent, France (Figure 2). The last available ECB data tells of €32.8 bln of government bonds and €4.92 bln of ESM/EFSF/EIB bonds purchased by the NCBs, while €3.28 bln have been bought directly by the ECB for a total of €41 bln of asset purchased. This corresponds roughly to a mere 4% of the overall program. Despite the thin sample, interesting patterns can already be observed: some obvious, other less. If we look at the bonds purchased that were trading at a negative yield (Figure 3), we obtain a picture fairly correspondent to the scenario represented in Figure 2. The ranking order of Figure 2 is somewhat respected; what we observe is that the sole starting of the program has driven the yields further in the negative territory, with the appearance of sub-zero yields also on Italian, Irish, Spanish and Slovak bonds. Furthermore, the NCBs seem to be not influenced in their purchase strategy by the increasing quota of bonds in the negative side, since the results of Figure 3 are compatible with a uniform purchase pattern that does not try to avoid negative yields. In reality, negative rates matter. More complex considerations arise in fact when we decompose the data sample by looking at the maturity of the purchased bond (Figure 4). It appears that the NCBs are prevalently using two purchase strategies. The most widely used, that we define for this reason the “standard” one provides a dominant quota (a bit higher than 40%) of medium term bonds up to 5 years, a lower quantity of medium-long term bonds hovering between 30% and 40%, and a residual part of long term debt securities that oscillates more but does not go much over 20%. Having considered that the major part of eligible assets are concentrated in the [2-5] years interval, it emerges that the NCBs that are following the standard strategy are purchasing in a uniform, predictable way. The NCBs of peripheral countries and, notably, of Austria and Netherlands are behaving in this regular manner. Things change for what regards Germany, France and the related group of small continental countries (Slovakia, Finland and Belgium). In fact, these “core” NCBs are implementing a different strategy that sees the purchase of a prevalent quota of medium-long term debt securities (the threshold of 40% is always breached). The level of medium term bonds bought is significantly lower with respect to the other group of central banks, while the quantity of long term bonds swings a lot, clearly playing the role of a residual quantity. The evidence hence suggests that something is altering the purchase strategy of these NCBs; negative yields have a role, but it seems strictly related to the impact of -0.2% lower limit. 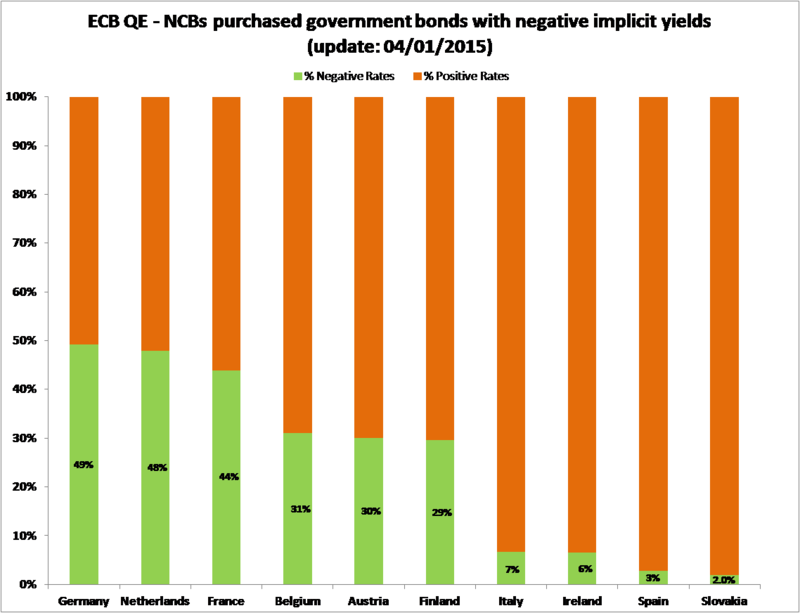 In other terms, the NCBs are willing to buy negative yields bonds, but they can only buy until they do not breach the bound imposed by the ECB; in presence of the -0.2% limit, the NCBs are forced to comply with the rules, by shifting to long-dated bonds that are characterized by an higher yield (even if always negative). In this perspective, the potential damage that core NCBs may suffer from negative rates in terms of a reduced flows of interests is not affecting (for now) their purchasing behavior, despite the problem has not yet been addressed by the ECB. In summary, Bundesbank, Banque of France and the central banks of Finland, Belgium and maybe Slovakia are already suffering the impact of the -0.2% bound, while De Nederlandsche Bank, despite the high share of “sub-zero” bonds bought, is not under pressure to change its purchase strategy. 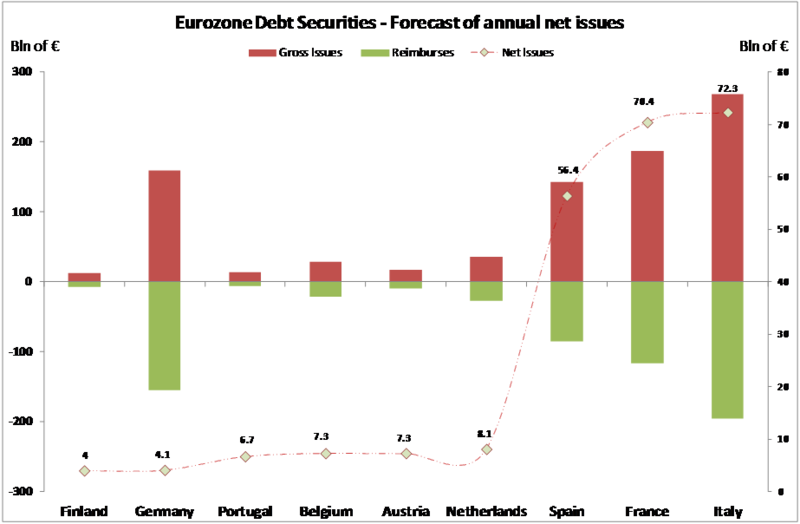 And this is only the beginning: the situation is likely getting worse if we take a glance of the future net issues of debt securities for the Eurozone (Figure 5). The projections clearly demonstrate the poor supply of core government bonds in the near future that could exacerbate the differentiated behavior of the central banks. In fact, a protracted asymmetry between the NCBs purchase patterns could potentially induce distortions in Eurozone government term structures, by pushing core long term yields lower than peripheral ones. This would imply a widening of spreads that does not appear coherent with the ECB target of restoring Eurozone yields convergence and that cannot be considered a sort of “proper” compensation for the minor profits endured by core NCBs. In the not so distant future, the ECB may be forced to revise the -0.2% lower bound in order to match the monthly asset purchase target of €60 bln. Time (and data) will tell.